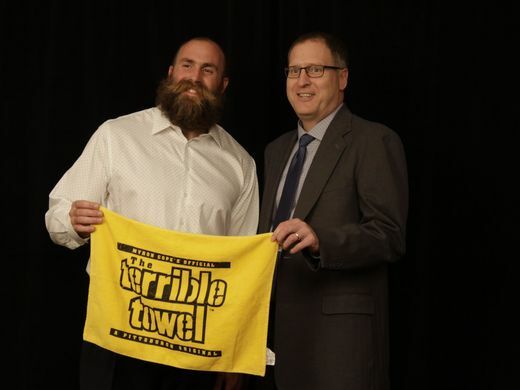 The transition to life after football has been a steady one for Pittsburgh Steelers’ great Brett Keisel. His new-found free time has given him the chance to explore different passions that he didn’t have time for in the past. The Pro-bowl defensive tackle and two-time Super Bowl champion now spends his time with his kids in the outdoors and speaking to groups about his journey to the NFL, which brought him to York on Thursday night. Keisel, who retired in June of 2015, has long had a reputation as someone who makes it a point to give back to the community. So when the York County Youth Development Center (YDC) reached out to Keisel to speak at the Children’s Benefit Dinner, he jumped at the opportunity to help. 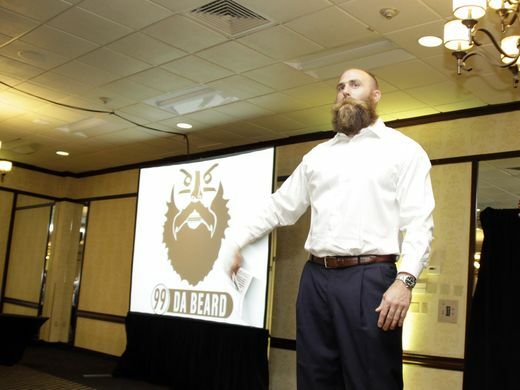 The man affectionately nicknamed “Da Beard” made the trip from Pittsburgh to York on Thursday and, before speaking to the 183 people at the dinner, he spent 90 minutes with the kids at the YDC. Every kid at the Youth Development Center met Keisel and had the chance to wear his two Super Bowl rings. “If you saw every kid try on his Super Bowl ring, it was amazing,” YDC director Rodney Wagner said. Keisel has seen his share of ups and downs on his way from a small town in Wyoming to a successful football career with the Steelers. The message that Keisel brings is the reason why Wagner reached out to the former defensive end. The visit was exciting for York County Steelers fans as well, who packed the ballroom at the Wyndham Garden for the event. York County residents Bill and Melissa Ness had the chance to meet with Keisel before the dinner and enjoyed the interaction they had with the Steelers’ great. Keisel talked with the couple about the breast cancer awareness shirt Melissa was wearing, Bill Ness said. “He was very friendly, very open. Very approachable,” Melissa Ness said. While playing football is in the rearview mirror for Keisel, he still has plenty of faith in his former team. The Steelers are coming off a 10-6 season in 2015 and an appearance in the AFC Divisional round of the playoffs. “They’re going to be tough,” Keisel said about Pittsburgh. “They’ve got as many weapons as I’ve ever seen a Steeler team have. They’re loaded all over. I think their defense is better than it was last year under Coach Keith Butler. I expect those guys to do big things. “The future is bright,” he added. Listen to Brett’s interview and view more photos HERE.